After my post about Otto the Snake one gentle reader pointed out there are quite a few people who are terrified of snakes…so today I’m writing about something a little fluffier, if not friendlier – owls! Owls live pretty much everywhere on our planet, except for Antarctica. No vampire lore like Willow the Vampire & the Sacred Grove would be complete without a hooting owl or two to set the scene and get us in the mood for a bit of blood-curdling storytelling. If it weren’t for the biting, scratching, hair-pulling and morbid fascination vampires hold for me, I’d probably have made Willow an owl rather than a vampire child! The Tawny Owl, a beautiful tortoiseshell coloured creature, is a resident of Europe, with a habitat stretching from Scandinavia in the north to Italy in the south. 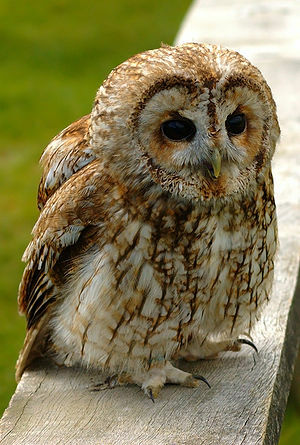 Tawny Owls prefer a woodland and open grassland habitat, where they can hunt small mammals like rodents, such as voles and mice. Owls have excellent night vision thanks to their enormous eyes. The Snowy Owl lives in arctic climes and has a beautiful coat of white fluffy feathers that enable it to blend in and practically disappear from sight as it glides over the snow-covered landscape called the tundra. A large number of owl species hunts at night, relying almost entirely on the dark to hide and protect them from larger predators. Arctic summers, however, have very long days and thus the Snowy Owl is forced to hunt during daylight hours to find food. The snowy coat helps the owl to stay safe. Owls may look quite cuddly but they are strong and silent killers which strike from above. An attacking owl swings its feet forward as it gets near its prey. Spreading its toes widely, the owl tries to grab its prey and trap it, so it cannot escape. The owl’s talons slash and pierce the prey’s skin, more often than not the victim dies straight away, but if it doesn’t, the owl will kill it with a nip to the neck bone. The owl’s long tail feathers stabilize the airborne predator as it swoops down for the kill. Forward-looking, large eyes enable the owl to be a good judge of distances and its powerful legs help to cushion the impact of landing and crushing its prey to the ground. Owls have acute hearing and the shape of their head enables them to hear a sound on one side of the head just a fraction of a second prior to catching the sound with the other ear. The reason for this amazing hearing is not that owls are nosy and want to listen in on their neighbours’ conversations – this acute hearing helps the owl to accurately pin point mice and voles in utter darkness by just the tiniest of sounds made by the prey’s movement in grass or undergrowth. Vampires like Willow have very acute hearing, too. Their supernatural powers enable them to hunt for humans in total darkness; they just concentrate on the blood pulsating in human veins and the thumping of human hearts…well that and the fact that most humans reek of either sweat, aftershave, deodorant or perfume…and some of them stink of all of the above! I just want to mention I am new to blogs and seriously enjoyed this web blog. Likely I’m likely to bookmark your blog . You really come with good writings. Cheers for sharing your web site. Thank you for visiting my blogsite. In answer to your question, you can either click “Follow” at the very top of the screen, or you can click the Follow button on the right hand side for Twitter, or a little further down on the right you can click the Follow by email button. once you click it, WordPress should ask you to supply your user name and email address. Thanks for liking my Willow the Vampire blog…yes she is quite adorable, even if does bite from time to time! thank you for the compliment on my Willow the Vampire site. Nice to hear that people like the look and content.